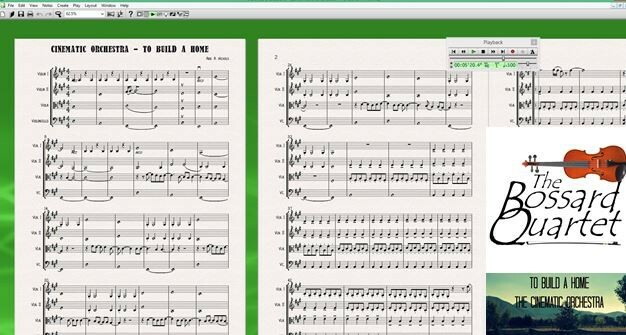 We love getting new arrangement requests – the latest is from Lucy and Duncan for a String Quartet Arrangement Of The Cinematic Orchestra – To Build A Home. The off-season for us is a chance to regather our thoughts, tidy up the music pads, and make some new arrangements! We are looking forward to playing this at their wedding in August, and hope to have plenty of chances to try it out beforehand. The song is gorgeous, starting with some simple piano chords and a melody, and then moving to a more driving pace that builds throughout the song. We have tried to do it justice and I’m sure it will sound lovely in string quartet form. If you are getting married and have booked us, remember to think about any customised songs that we can arrange for you to make your day unique!